FILE - Wanted terrorist Mokhtar Belmokhtar speaks in this undated still image taken from video released by Sahara Media, Jan. 21, 2013. Late last week, a report suggested that wanted terrorist leader Mokhtar Belmokhtar, who has been declared dead at least three times, might still be alive. In this latest twist, a Saudi magazine based in London, El Majaala, is reporting that two militant Islamist leaders arrested in Algeria said Belmokhtar is living somewhere along the lawless border areas of Mali, Niger or Chad. Experts on Islamist radical movements in Africa said such reports cannot be dismissed. “I think it’s quite possible he’s still alive,” said John Campbell, a former U.S. ambassador to Nigeria, and a senior fellow for Africa policy studies at the Council on Foreign Relations in Washington. “There is absolutely no clear confirmation of his death from governments or jihadists, so you cannot rule out that he is alive,” said Jacob Zenn, an expert on extremism at the Jamestown Foundation in Washington. A spokeswoman for the U.S. military's Africa Command, Samantha Reho, said AFRICOM is aware of allegations that Belmokhtar is still alive. “However, we have no clear indications of his continued activity,” she said in a statement to VOA. Belmokhtar is best known for the hostage crisis he masterminded in January 2013 at the Ain Amenas gas facility in Algeria, where more than 800 people were taken hostage by his newly formed terrorist group, al-Mulathameen (Masked) Brigade. 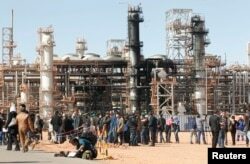 A general view of damage is seen following an attack and ensuing siege by Islamist militants at a gas plant in Ain Amenas, Algeria, Jan. 31, 2013. Mokhtar Belmokhtar was seen as the mastermind of the operation. Thirty-nine of the hostages were killed before the rest were rescued. A few months later, Belmokhtar’s group attacked a French-owned uranium factory near the town of Arlit in northern Niger, an attack he later said was retaliation for France's intervention in Mali. “He is among the most significant terrorist leaders in Africa because of his operational range from Algeria and Libya to Nigeria and his long-time loyalty to al-Qaida, despite his record of being an independent-minded terrorist who has clashed with AQIM leadership and hierarchies,” said Zenn. With the possible exception of Boko Haram's Abubakar Shekau, no African terrorist leader has been declared dead as many times as Belmokhtar. Belmokhtar was first declared dead in March of 2013 by Chadian state television, which reported that Chadian soldiers in Mali had killed the terrorist leader at a base in northern Mali. This was later repeated by Chadian President Idriss Deby, despite a denial from by al-Qaeda and Belmokhtar’s spokesman. In June 2015, the Libyan government announced that Belmokhtar had been killed in a U.S. air raid in Libya. The U.S. did confirm that Belmokhtar was targeted in the air raid, but never confirmed his death. In November 2016, French warplanes targeted Belmokhtar in air raids over southern Libya, based on intelligence from the U.S.
“He … gained a mystique for being declared dead, yet resurfacing to be alive many times,” said Zenn. FILE - A wanted poster from the website of the U.S. State Department's Rewards For Justice program shows a mugshot of terrorist Mokhtar Belmokhtar. According to Campbell, Belmokhtar presents a particular challenge as a terrorist leader. “He’s a very good example of how a person can be a criminal (a smuggler or a kidnapper), can be a jihadi radical, and can be a revolutionary all at one time, and depending on what the circumstances are,” he said. Zenn said Belmokhtar’s real contribution to jihadism has been his ability to bridge insurgent elements all the way from Nigeria and other parts of the Sahel to Algeria and Libya. He has extensive connections with the local tribes in the Sahel through marriage. Campbell said there is a good reason for counterterrorism officials to be worried about reports that Belmokhtar is still alive. “If he’s still alive, he can conduct an operation against a government or privately owned facility anywhere across a large swath of West Africa,” he said. “He could carry out operations in the future, not dissimilar to those that he did in the past. And after all, some of them were really quite significant,” he added. But the U.S. will not be deterred by these reports in its fight against terrorists and terrorist networks said AFRICOM spokeswoman Reho. “Our mission in the region has not changed,” she said. “The United States will not relent in its mission to degrade, disrupt and destroy terrorist organizations … and bring stability to the region. We are committed to maintaining pressure on the terror network and preventing terrorists from establishing safe havens,” she added. Mehdi Jedinia contributed to this report.